The following obituary was taken from the front page of the Hinton Daily News dated Saturday, Novemebr 26, 1938. Morris Novel Gwinn, 69 years old, retired Chesapeake and Ohio telegraph operator of Meadow Creek and a widely known resident of the county, died Friday night at 9:00 o"clock at the Hinton Hospital, where he had been confined since July 1. He was an uncle of C. N. Gwinn, assistant superintendent of county schools, and Mrs. E. B. Fox, of Summers street. Funeral services will be held Sunday afternoon at 2:30 o"clock at the Meadow Creek Baptist Church with which he had been affiliated for many years. The Rev.H. P. Hackney, pastor of the Central Baptist Church of Hinton, will officiate assisted by Rev. E. W. Billings, pastor of the First Baptist Church of this city. The Masonic order will participate in the services. Burial will be made in the Gwinn family cemetery at Meadow Creek. Friends and neighbors of the section will serve as pallbearers. Honorary pallbearers named were; W. T. Fredeking, G. J. Hughes, James Morris, T. E. Hanifin, F. T. Reese, F. E. Huddleston, Dr. J. T. Johnson, E. V. Bleau, B. B. Bleau, Walter Smith, C. B. Garten and A. A. Addleman. 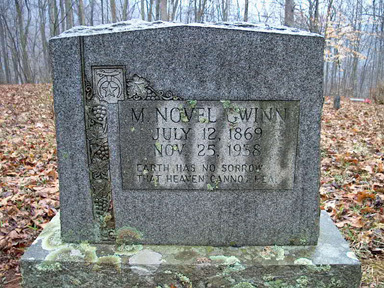 Mr. Gwinn was a life long resident of the county, having been born at Meadow Creek on July 12, 1869. He had spent his entire life in that section. He was a son of Lewis W. and Elizabeth Kaylor Gwinn. He entered the employ of the C & O on Febuary 1, 1889, and retired about ten years ago. He was a member of the Beni Kedem shrine of Charleston, and the Hinton lodge of A.F and A. M., and had a large number of acquaintances both in Hinton and about the county. Mr. Gwinn was unmarried. In addition to his niece and nephew, Mrs. Fox and C. N. Gwinn, he is survived by three brothers, E. G. Gwinn, M. E. Gwinn and L. M. Gwinn, all of Meadow Creek; and one sister, Miss Mary Gwinn, also of Meadow Creek.